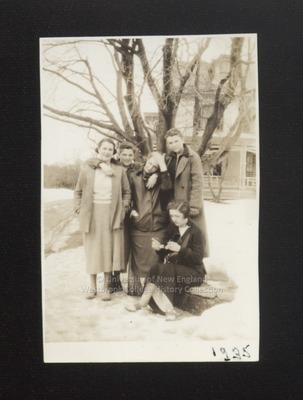 Five Westbrook Junior College students stand on a packed-down snowy sidewalk in this sepia toned candid snapshot labeled 1935 on the front. Four of the young women stand before a bare tree and house corner; one is seated on a small stone retaining wall. On the back of the photo is written in blue ink: Moore, Cole, Cunningham, Bonheur, Betsy? Moore and Cunningham wear wool or gabardine skits and light winter jackets. Shirley Cole, head only showing, has her arms about the shoulders of Moore and Cunningham. Bonheur wears a long winter coat; and Betsy, seated on the retaining wall, holds a pair of glasses.